Brutalist or minimalist architecture is better suited to families with children than you might think, says Will Wiles in his latest Opinion column. I write these words through a fog of exhaustion. On the last day of September we welcomed into the world our second child. The nights since have not been peaceful or restful. But before this zombie-like state of constant fatigue, when my daughter's due date was still ahead of us, I did reflect on how life has changed since the arrival of my son, four years ago. And I came to realise that he had done a good deal to change the way I look at architecture, and the built world in general. Accessibility, for instance. Step-free circulation, lifts, decent toilet facilities – before spawning, I understood the necessity of these things, and the incivility of places that lacked them. But afterwards, with a baby in a buggy and things to do, I was treated to a more visceral insight. I now properly grasp that it's not about courtesy or convenience, it's about justice. Your mental map of the city convulses, and great chunks of it wither away as they are removed from practical reach. "A lot of preconceptions about kids and architecture are actually proved wrong when confronted with real kids"
It's quite possible to understand this on an abstract level without direct personal experience, but watching certain urban possibilities dying in front of you certainly puts some emphasis on the issue, and I'm well aware that I only felt a fraction of the frustration that some people have to endure every day of their lives. Meanwhile, places that I might have avoided in younger years became welcoming. Living in east London, this meant the Westfield Stratford shopping centre and Canary Wharf, both of which are stiff with lifts, ramps and capacious toilets, and linked by the mostly step-free Docklands Light Railway. Soulless corporate wastelands they may be, but it's worth looking at what they get right and what they make easy. But a lot of preconceptions about kids and architecture are actually proved wrong when confronted with real kids. I recently interviewed the noted minimalist John Pawson. Minutes after we met, without any prompting from me, he brought up the scene in the 1990s sitcom Absolutely Fabulous when scatty fashion publicist Edina, played by Jennifer Saunders, is visited by friends who she remembers as ardent minimalists. Ahead of their arrival she desperately tries to tidy her house, fearing their disdain at its disorder. But they now have young children, and they arrive in a typhoon of clutter and disorganisation, their existenzminimum pretensions blown away for good. Pawson has children, and raised them in a minimalist home of his own design, so I asked him if it was difficult to combine the two. He said no, it wasn't – children love minimalist spaces. And he's right. Children might be very good at creating mess and clutter, but that's not because they can only exist in messy, cluttered conditions. They like to have room to bang about and clear space to play. "Some modern architectural styles seem to invite toddler-level appreciation"
I was reminded of the first time we took our son, then aged two, to visit the flat we now live in. It was newly built and unfurnished, all white paint and grey carpet. Not very interesting, but its emptiness seemed to fill him with energy, and he charged happily from room to room as if laying claim to to the place. Naturally we have since filled it up with things, and will not be opting for Pawsonian minimalism any time soon, but if you have the rare good fortune of enough storage space and picking-up time, I can see how it would be done. Toddlers do have a knack for feeling at home in places, even in places where they should not. Their mobility, as well as their gleeful wish to dash about, develop much faster than the more sophisticated sense that different places have different rules and expectations. It's this lack of boundaries that can make them such bad adverts for children in general. But I'm not making any excuses for bad behaviour. The instance, a few years ago, of young children filmed clambering all over a Donald Judd sculpture at the Tate Modern springs to mind. Though he has not yet endangered any masterpieces of modern art, our boy does have an undesirable fondness for wedging himself into tiny niches and gaps, such as the narrow defile behind bus shelters or between beach huts, or the recesses used to store fire extinguishers. It was necessary to grow new architectural antennae in order to spot these "toddlernooks" early. This little habit meant some hitherto benign spaces became freighted with concern, but others became more appealing. I developed a new enjoyment of architectural applications of the continuous surface and the gradient. When I visited Zaha Hadid's Heydar Aliyev Centre in Baku a couple of years ago, one of my first thoughts was that I wished the boy was with me, as I could imagine his enjoyment of the curves and slopes of its extraordinary atrium. Some modern architectural styles seem to invite this sort of toddler-level appreciation. Paradoxically, it appears to be particularly true of the ones that most divide critical opinion: parametricism and brutalist modernism. The architect Neave Brown, for instance, enthuses about the potential of his Alexandra Road housing development as a play space in Tom Cordell's wonderful film Utopia London; the RIBA managed to tap into this connection with its Brutalist Playground installation in 2014. "Having kids has helped unlock for me the secret of why I already liked some places and things"
Trying to see architecture through the eyes of a young child has not made me appreciate it more – and I should say, because I know that it can be a delicate subject, that I'm not suggesting for a moment that having kids makes you any better at looking at built space. Rather, it has helped unlock for me the secret of why I already liked some places and things. Again, the Tate Modern comes to mind. My wife describes its immense Turbine Hall as a place where kids could end up feeling too comfortable. 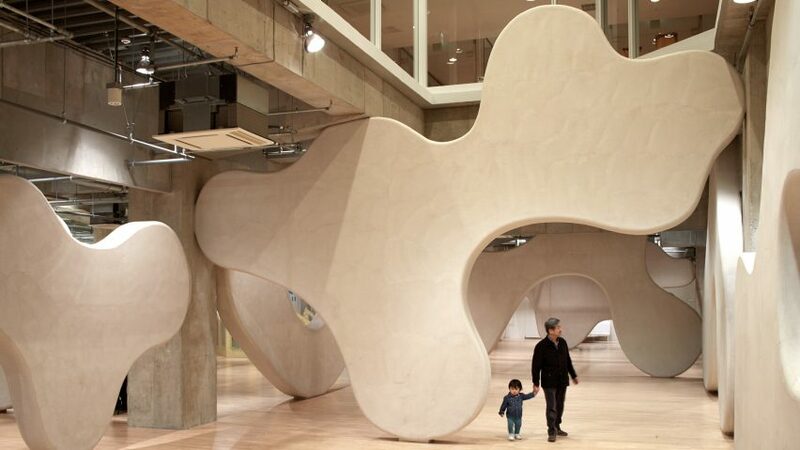 Herzog & de Meuron's ramp down into the space simply begs children to pick up speed, while the cavernous hall is an invitation to them to raise the volume. The results can make it feel, at times, more like a soft play area than a major museum. But what does it mean for somewhere to "feel like a major museum"? Unwelcoming? Adults only? The whole question of whether kids belong in galleries at all can be pretty fraught, so I'll steer clear of it, but I am sure that what makes the Turbine Hall such an astonishingly successful public space is the at-home-ness it transmits to children. Dealing with the consequences of that is the responsibility of the parents. Will Wiles is the author of two novels with architectural themes: Care of Wooden Floors, in which a man is driven mad by a minimalist apartment, and The Way Inn, a horror story set in an anonymous chain hotel. He is contributing editor at Icon magazine and a freelance design journalist.